It’s not a new idea that poets and scientists should talk to one another. During a visit to Florence in 1638, the young John Milton sought out Galileo Galilei. By then a blind old man, Galileo was living under house arrest, confined by the Inquisition for asserting, after his celestial observations, that the Earth revolved around the sun. Years later, old and blind himself, Milton would pay homage—in his epic poem about the origins of our universe, Paradise Lost—to the great astronomer, who makes a cameo appearance with his telescope pointed at the sun’s dark spots. Five years ago I got my first job, as a research fellow at Gonville and Caius College, Cambridge; in the stray hours between thinking about Milton or Donne, I finished my first book of poems. In college, a wooden ramp across the four-hundred-year-old stone steps is the only outward sign of its most famous fellow. Fifty years ago, Stephen Hawking arrived fresh from his Ph.D. (as I did) to take up a research fellowship at Caius, then never left. Within that community, where I would sit down to lunch with friends in maths, genetics, or cognitive science, traces of those conversations began to creep into my notebooks and even into poems. When I got the commission to write a poem on light for this year’s National Poetry Day—today, in the UK—my first thought was paradoxically of its absence: the black holes whose mysteries Professor Hawking has spent his career working to unfold. When I wrote to Stephen to let him know about the poem dedicated to him, he asked to meet. Pulling my chair closer to his, I read him the first draft of “Relativity,” accompanied by the soft, periodic beeps of his speech computer. I told him how I’d tried to re-create some of the excitement and awe at the cosmos I had felt reading A Brief History of Time in my early teens; how I first pulled a worn copy off the shelf in my local public library. At that age I was making regular trips there to devour all the paperback science fiction I could find. Physics at school was hardly my strong suit, but the same curiosity that made me love Asimov, Sagan, and Star Trek pushed me to read about wormholes and time travel “in the real world.” Later I got hold of his book on audiocassette and let it wash over me, half understanding, in the dark of my childhood bedroom, with the Walkman gears whirring under the covers. I had painted the ceiling black one summer, then spent days up a ladder stippling it with stars. Watching up close the painstaking process of cheek twitches and scrolling word menus by which Hawking communicates—it took him a quarter of an hour to type a single sentence, which then boomed from the speaker into the quiet room—filled me with a sense of the preciousness of language. Even as he offered to read my poem for National Poetry Day, he was self-deprecating about the synthesized voice he says he now thinks in: it is not very musical. To the contrary, I tried to reassure him, it has a rhythm and harmonics all of its own. Listening to recording after recording, I’d tried to hear it in my mind as I wrote and rewrote my lines. It was originally designed for a telephone directory, he added, with what I imagined was a chuckle. We’d shared a joke earlier about the strings of random words that flash up on his screen whenever the cheek sensor picks up stray movements, when he’s eating, say, or the sensor is set too high: he should publish a volume of experimental poems. Science relies on metaphor—traditionally the poet’s tool—to describe and communicate itself. This was a recurring theme of my chats with scientific colleagues, who in their teaching come up with analogies to explain complex ideas for their students or phenomena taking place at a level we can’t see. They were conscious, too, of how these metaphors can mislead, making the known and the unknown seem more alike than they really are. I wanted to explore that tension in “Relativity,” whose title points to Einstein’s celebrated theory of 1915, a hundred years old this year. For me, relativity also suggests the relationship between two things in a comparison—the ligature of the word like, which chimes through my poem—whose interplay enables us to think. That the imaginative terrain of poets and physicists might overlap is nowhere clearer than in the thought experiments Einstein devised. Experiments that take place only in the mind, they make use of vivid props drawn from everyday life—trains, clocks, elevators—to lead us through the realms of the previously unthinkable. In one, Einstein imagined chasing a beam of light, a flight of imagination that led eventually to special relativity. Still another of his relativity thought experiments involves a moving train and two observers (one onboard, the other on the platform) who see the same flash of light. Einstein combined these ingredients into a paradox only solvable by realizing that time actually moves more slowly for the person on the speeding train. My poem’s two-line stanzas are the train tracks of Einstein’s imagined scene: parallel lines that will impossibly meet in the black-hole singularity his theories predict, where time stops and space ceases to make sense. As objects we can only ever observe indirectly, black holes are a powerful symbol of what we don’t understand about the universe—terrifying and thrilling. 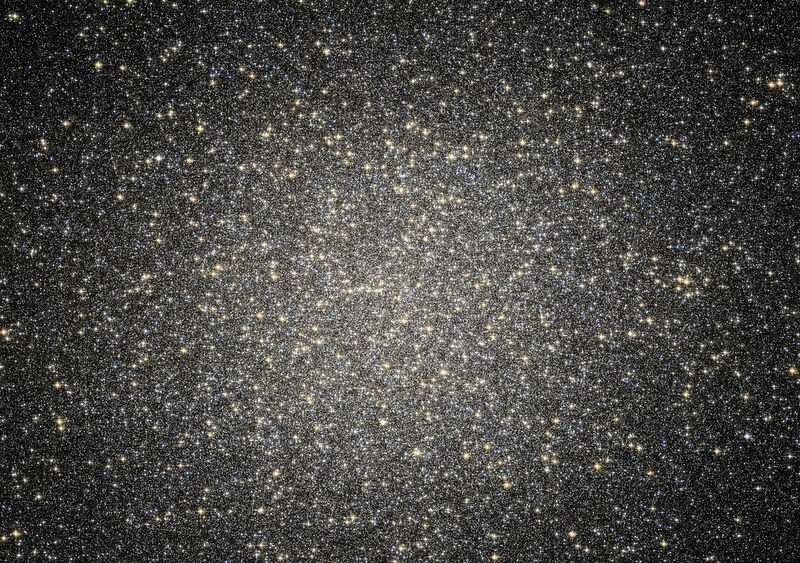 In formal terms, “Relativity” is a sonnet, a form I started to think of as a sort of black hole exerting its own gravitational pull, compressing an everywhere into its little room. Yet my sonnet starts with light not as it exists in the large-scale world of gravity but at the subatomic level of quantum physics. It is the grail of contemporary physicists to make these two irreconcilable theories speak to one another. The first part of “Relativity” recounts the physical experiment that demonstrates that light leads a double life. A light beam is shone through parallel slits: the photons behave like particles when observed passing through the aperture, but by the time they hit the screen opposite they’re acting as waves, interfering to create a striped pattern of dark and bright bands—just like the stanzas of my poem. The so-called wave-particle duality is the notion that quantum objects behave like waves until you try to locate them, when that behavior disappears. Physicists now believe that it and Heisenberg’s famous uncertainty principle are just two manifestations of the same underlying phenomenon. There are, of course, many poets more recent than Milton who have turned to science for inspiration: Lavinia Greenlaw, Gwyneth Lewis, Jorie Graham, J. H. Prynne, to name just a few. While writing “Relativity,” I found myself haunted by a line—“Our eyes adjust to the dark”—in a poem by Tracy K. Smith from her extraordinary, Pulitzer Prize–winning third collection, Life on Mars. Smith’s father was one of the engineers who worked on the Hubble Space Telescope. In “My God, It’s Full of Stars,” she imagines Hubble’s “oracle-eye” illuminating “the edge of all there is.” Might not our eyes adjust to the dark? Smith’s phrase echoes at the end of my poem, where it resurfaced as a question, a hypothetical—deferred, yet hopeful. After all, both Galileo and Milton in their blindness came to rely on other sorts of eyes. Sarah Howe’s Loop of Jade was shortlisted for the Forward Prize for Best First Collection. She is a Fellow at Harvard University’s Radcliffe Institute.